June 30, 2010, 6 p.m.
By Megan Garber @megangarber June 30, 2010, 6 p.m. In other words, the new site is trying to balance two major, and often conflicting, goals of news consumption: personalization and serendipity. The more specific purpose of today’s changes, Google says, is threefold: first, to have consumers tell Google what stories most interest them; second, to help those consumers keep track of ongoing stories; and third, to help them share stories with others. POSTED June 30, 2010, 6 p.m.
Garber, Megan. 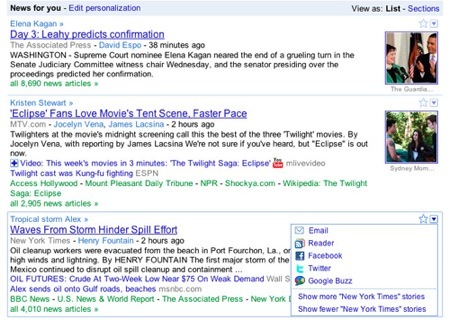 "Google News revamps with “news for you” angle." Nieman Journalism Lab. Nieman Foundation for Journalism at Harvard, 30 Jun. 2010. Web. 19 Apr. 2019. Garber, Megan. "Google News revamps with “news for you” angle." Nieman Journalism Lab. Last modified June 30, 2010. Accessed April 19, 2019. https://www.niemanlab.org/2010/06/google-news-revamps-with-%e2%80%9cnews-for-you%e2%80%9d-angle/.